Beazell J, Grindstaff T, Sauer L, Magrum E, Ingersoll C, Hertel J. Journal of Orthopaedic and Sports Physical Therapy 2012, 42(2):125-134. Abstracted by: Amy Clark, PT, ScD, COMT, Fort Worth, TX–Fellowship Candidate, IAOM-US Fellowship Program. Recurrent ankle sprains and repetitive episodes of “giving way” have been described as chronic ankle instability (CAI). CAI is thought to be related to ligamentous and soft tissue damage to the lateral ankle structures and is further confounded by altered muscle activation, decreased range of motion (ROM) and balance deficits. Decreased dorsiflexion (DF) ROM due to altered joint arthrokinematics may adversely affect running biomechanics in individuals with CAI, leading to an increased risk of re-injury. Joint mobilization or manipulation of the proximal tibiofibular joint (PTFJ) or distal tibiofibular joint (DTFJ) may offer the ability to restore arthrokinematics and improve function. The purpose of this study is to determine whether a proximal or distal tibiofibular manipulation would improve ankle DF ROM and functional outcomes over a 3-week period. Forty-three participants with CAI volunteered and qualified to participate in a randomly assigned treatment group of 1) PTFJ manipulation, 2) DTFJ manipulation or 3) no treatment (control). CAI was defined as a history of at least 1 ankle sprain and additional episodes of ankle instability (giving way), as well as a score of at least 85% on the Foot and Ankle Ability Measure (FAAM) sports subscale or at least 3 on the modified Ankle Instability Instrument. Additionally, all participants had to have an ankle DF ROM deficit of at least 5 degrees in weight bearing (Figure 1)compared to the opposite side. Additionally, participants completed the BESS foam test (Figure 2) and the step-down test (Figure 3). Individuals were not allowed to participate if they had a lower extremity injury or surgery within the past 6 months (including lateral ankle sprains), diagnosed ankle osteoarthritis, or current pregnancy. Figure 1 Ankle weight-bearing ROM test was performed by asking the subjects to lunge forward to the point at which they were unable to move farther without lifting the heel from the ground. A bubble inclinometer was used to measure the angle of the tibia relative to the ground Figure 2 The BESS foam trial: Subject stands on a medium-density foam pad for 20-seconds placing their hands on their hips, flexing their non-weight-bearing hip to approximately 30 degrees eyes closed. If they did not maintain the original test position, they were instructed to resume the original position as soon as possible. Points for errors were deducted if the participant failed to maintain hands on the hips, opened their eyes, flexed the hip greater than 30 degrees, lifted the foot from the foam surface, or remained out of the original test position for longer than 5 seconds. Points were also deducted if the participant touched the ground or the weight-bearing limb to the contralateral limb. Figure 3 (left and right): For the Step-Down Test, participants stood on a 20-cm high step, with the hands on the hips, the knee straight, and the foot positioned close to the edge of the step. The involved limb remained on the step, and the participant was instructed to lower the non-weight-bearing limb toward the floor by bending the knee of the weight-bearing limb until the heel gently contacted the floor and then returned to a standing position. Five repetitions were performed, and a video camera was used to record movement. Points were deducted when technical errors occurred during testing, to a maximum of 6 possible points. Errors included removing the hands from the hips, pelvis rotation or elevation, trunk lean, knee valgus, inability to maintain balance, or weight bearing by the non-weight-bearing limb. After baseline data were gathered, participants were assigned to 1 of 3 experimental interventions: proximal tibiofibular manipulation (Figure 4), distal tibiofibular manipulation (Figure 5) or no treatment (control). They then received one of the randomly assigned interventions three times during a three-week period. Post-test measures were taken in the same manner as pre-test measures. Investigators performing the test were blinded as to which intervention subjects received. Figure 4: The PTFJ manipulation was performed with the subject supine. The provider stabilized the fibula by placing the index finger and thumb of one hand to the fibular head and mobilized the distal end of the tibia by providing a thrust toward the ipsilateral buttock. This motion translated the proximal fibula in an anterior direction relative to the tibia Figure 5: The DTFJ manipulation was performed with the subject supine. The provider grasped and stabilized the distal tibia with one hand and grasped the distal fibula between the finger and the thenar eminence of the other hand. The fibula was then manipulated posterior-superiorly. No significant differences were found between any of the subject group demographics. A significant increase in DF was identified in all three groups during post-testing. There was no significant difference between groups in functional testing. The use of a proximal or distal tibiofibular joint manipulation in isolation did not enhance outcome effects beyond those of the control group. The increases of ankle DF in all three groups may be due to practice effects associated with testing. 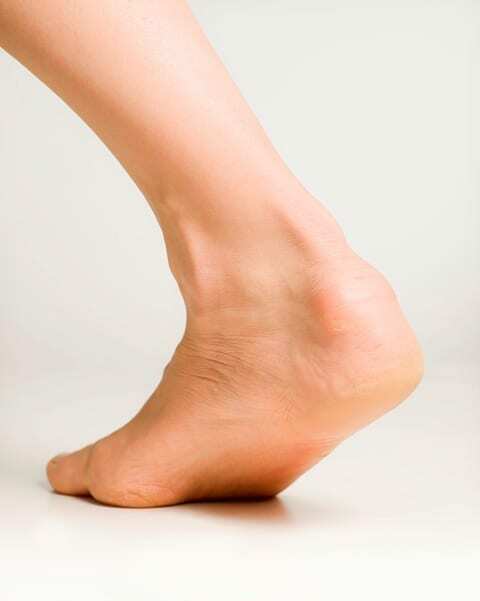 This article explores the idea that a PTFJ or DTFJ manipulation may improve DF ROM status-post plantarflexion/inversion (PF/INV) trauma, which may in turn prevent re-injury to the lateral structures of the ankle. Athletes lacking full DF may compensate during the landing phase of running by pushing off too quickly during the midstance to push-off phase of gait. Pushing off too quickly may force the athlete to plantarflex and invert abruptly and place too much stress on the lateral structures of the ankle. Ankle DF limitations may be due to a hypomobility within the TaloCrural Joint (TCJ), PTFJ or DTFJ. This article explores the mechanics of the PTFJ and DTFJ mobility with DF. In the IAOM-US course, Clinical Examination and Manual Therapy of Ankle and Foot, the PTFJ is said to belong anatomically to the knee, but functionally to the ankle/foot. Rotating about an oblique axis, the PTFJ glides inferiorly and posteriorly during PF/INV and the DTFJ glides inferiorly and anteriorly during PF/INV. After a lateral ankle sprain, the fibula may become locked posteriorly at the PTFJ, lending to pain and limitation with DF in WB. The PTFJ may also become hypermobile during after a plantarflexion-inversion trauma at the ankle; this may in turn produce an increase in fibular head movement and then lead to a peroneal nerve compression injury. Individuals with a peroneal nerve injury may complain of paresthesias and/or pain in the anterior lateral lower leg. The mobilization for the PTFJ described in this article is different than that practiced by the IAOM (Figure 6). In the instance that the PTFJ presents as hypermobile after the mobilization technique, taping techniques may then be used to help stabilize (Figure 7). The IAOM also emphasizes the importance of testing the joint mobility prior to mobilization/manipulation. Joint mobilizations and manipulations are only performed if the joint is hypomobile. The IAOM does not describe a technique to mobilize the DTFJ. Figure 6 (left picture): The IAOM technique is performed with the individual in quadruped (with the knee in about 80 degrees of flexion) with the foot hanging over the edge on the table. With one hand, the therapist holds the patient’s ankle in dorsal extension. The base of the palm of the other hand is placed on the posterior aspect of the fibular head. The fibula is mobilized in an anterolateral direction. This technique can also be performed as a manipulation. In this instance, the patient’s ankle is positioned in the resting position (10 degrees plantar flexion). Figure 7 (right picture): PTFJ tape. The patient will be standing with a block underneath the foot so that the ankle is in full DF. Tape is applied to the medial aspect of the anterior inferior femur and is then pulled behind the popliteus, across the PTFJ and finally attached to the anterior aspect of the tibia, so that the fibula is stabilized in an anterior position. The study mentioned in this article explores the effects of a PTFJ or DTFJ mobilization to increase ankle DF. However, DF limitations may also occur due to gastrocnemius tightness, hypomobile TCJ and/or malpositioning of the tibia in relation to the talus. These 3 alternative problems would be treated differently. The gastrocnemius may be treated with stretching and massage techniques. A hypomobile TCJ may be treated with joint-specific treatment techniques. Because the anterior talofibular ligament (ATFL) keeps the tibia from sliding backward on the 10 degree declination of the talus, chronic ankle sprains will often lead to ATFL’s inability to maintain this neutral position. The tibia will then be positioned further behind on the talus. Individuals with this malpositioning will often have normal DF ROM in NWB but limited in WB due to the compression of the talus against the tibia. Another limitation of this study may be the fact that the PTFJ and DTFJ were not evaluated for joint play before mobilization. A joint that is not hypomobile will not benefit from mobilization or manipulation and may actually adversely affect recovery. In the future, it may be beneficial to explore other treatment avenues to compare to the PTFJ and DTFJ instead of no treatment at all.